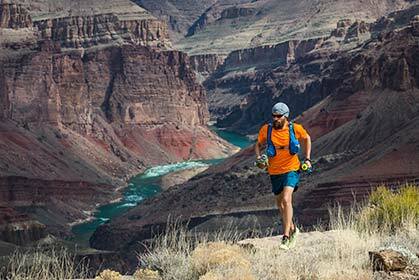 So you want to be a trail runner? Maybe you’re a seasoned road veteran who wants to mix up your routine. Maybe you’re a running rookie altogether. 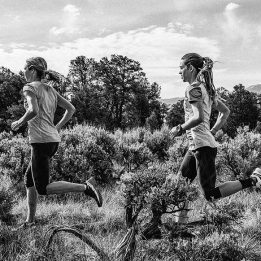 Maybe you feel the call of the wild, beckoned by YouTube footage of runners prancing up and down mountains. 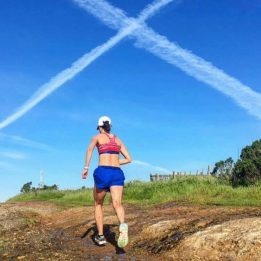 Maybe you have a friend or colleague who can’t stop talking about her latest group trail run, and you want to see what all the fuss is about. Whatever your reasons, congratulations! Call us biased here at Trail Runner, but we feel trail running is a great way to spend your time. Every run is like an adventure rather than a grind, and you will discover new places, both far off (maybe farther than you ever thought you’d be able to run) and hidden right under your nose in the unpaved nooks and crevasses of your hometown. Whether you have ample time to devote to this new hobby or are simply looking for a quick daily breather from the hassles of life, you will be happier, healthier and more energized as a trail runner. You will challenge yourself mentally and physically, and, along the way, you will see great new things and meet great new people. So, if you’re ready to get off road, read on. We’ve asked some of the fastest, smartest and most resourceful people in the trail-running world for their advice on how to get started—where to go, how to do it safely, how to fuel and train, what gear to pick out and, most importantly, how to fully enjoy the experience. 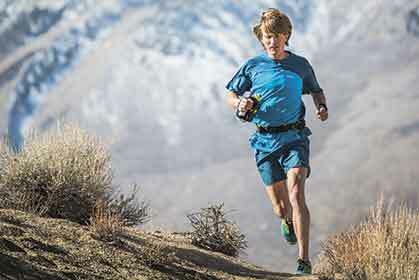 Trail running is truly as simple as taking a normal run and doing it on dirt. So, first, you’ll need to find some trails. To put it simply, trail running is a bit different than road running. If you obsess over paces, splits and distances, you will need to let go and relax. Undulating terrain and significant elevation gain and loss, to say nothing of tricky footing, will require that you slow down and shift gears regularly. Trail running is all about maintaining a steady effort, not a metronomic pace. Speaking of face planting, you will probably trip and fall at some point in your career as a trail runner. You can trust us, though, when we say it happens to everyone and we’re almost always fine afterward. Trail running will make your reflexes cat-like, and you will show off scars with pride! Trail running tends to require more dynamic movement than other forms of running. Sage Canaday, 28, of Boulder, Colorado, who won the 2014 Speedgoat 50K and The North Face Endurance Challenge 50-Mile Championships and also coaches several athletes, says the lateral movements and changes in pace can make trail running more challenging, but some of the challenge is offset by the slower overall pace necessitated by hills and more technical (rocky and rooty) terrain. 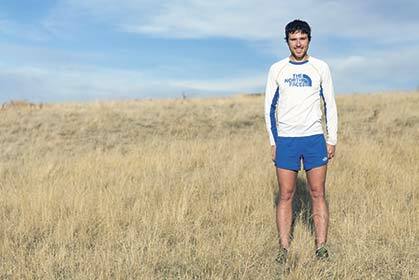 “Both road running and trail running are equally challenging if you push yourself 100 percent,” says Canaday. “On the trail, you need to read your body’s effort rather than relying on mile splits, and think more in terms of run duration than actual distance covered. For rocky and technical terrain: Quickly scan for foot placement about 10 to 15 feet ahead. Much like a mountain biker you want to “pick your line” to avoid tripping on rocks or landing with poor footing. 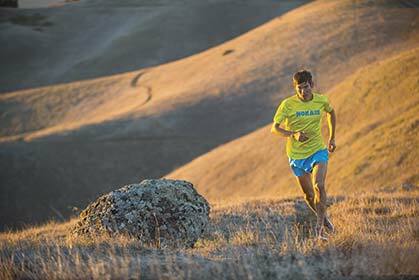 For running uphill: Employ a high cadence—frequent, quick steps—but a slower overall pace than on flat ground. Also, keep your line of sight 10 to 30 feet ahead and avoid hunching forward. Your uphill form should be slightly exaggerated with a more aggressive forward lean from the ankles, and the arms can swing more dynamically for added power. For running downhill: Run with a slight downhill lean from the ankles, and use a quick stride rate to ensure your foot falls under your center of gravity and not too far forward. Taking in calories on the run is not unique to trail running—any run longer than roughly 90 minutes, whether on roads or trails, will deplete your stored glycogen and require you to top off your tank. 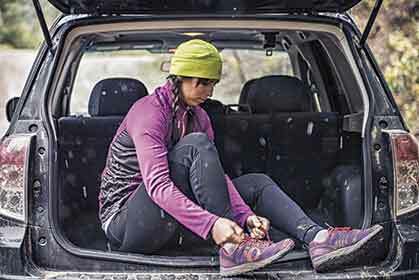 Since it often takes longer to cover a given distance on trails than on roads—and you’re less likely to find a convenience store along the way—carrying enough fuel is an important consideration for trail runners. Failing to adequately fuel can lead to the dreaded “bonk.” Also known as “hitting the wall,” the bonk occurs when your body runs out of fuel, sending you into a state of total-body fatigue and brain fog. It happens to everyone at some point, but you can usually avoid it by carrying enough calories on your run. How many calories do you need? Stephanie Howe, 31, of Bend, Oregon, a Ph.D. candidate in nutrition and exercise physiology who in her spare time won the 2014 Western States 100, says your body can process about 200 to 300 calories per hour while running, or 60 to 75 grams of carbohydrates. Since you typically burn over 100 calories per mile, and typically run more than two or three miles an hour, your body still goes into a calorie deficit, but spreading out the timing of your trail calories in can keep the bonk at bay. What should you eat? The colorful assortment of gels, chews, bars and drink mixes at your local running shop can be overwhelming, so experiment to find what works best for you. Don’t litter. Pack those used gel wrappers back into your pockets and toss them at home. If you see someone else’s trash, pick it up! Share. When runners are approaching, make room so you can both pass. Stay to the right, the same as driving. Alert others. Avoid startling others and enable them to make room for you by shouting a quick “on your left” as you pass them from behind. Yield. If you are on a shared trail, yield to mountain bikes (you can stop more easily) and horses. If runners are heading your direction and the trail is too narrow to share, the runner(s) on the uphill side of the trail should step off and let those on the downhill side pass before continuing. Mike Foote, of Missoula, Montana, spends a lot of time running on backcountry trails, where safety becomes a primary concern. 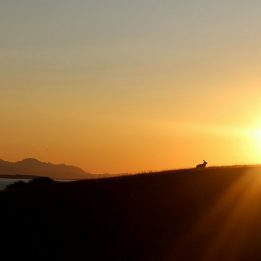 Photo by Tom Robertson. Proper shoes are crucial for running on any surface, but selecting the right pair becomes even more important when you step off the pavement. Traction: trail shoes feature lugs on their outsole to increase grip on dirt and mud and traction on hills. Protection: many trail shoes feature a stiff rock plate in the forefoot to protect your foot from sharp rocks and debris on the trail. Stability: many trail models offer more stability via beefier heel pockets and upper overlays, enabling maximum control and preventing ankle rolls on uneven terrain. Apparel: Running is a simple sport, and your kit will vary according to the seasons and location. 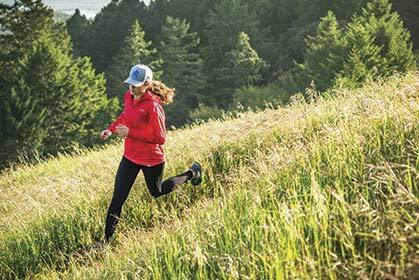 For short summer trail runs, shoes, non-cotton socks, a wicking T-shirt, shorts and a cap are often adequate. At the cool/cold end of the weather scale, you might add a long-sleeved base layer, a vest, a wind/rain jacket, tights or wind pants, gloves, a Buff band and a beanie. Night Light: You can’t rely on streetlights for trail runs or races that start/end in the dark, so you will likely want to invest in a quality headlamp. Data: A GPS watch and/or altimeter can help you track distance and vertical gain/loss for tracking and training purposes. Exploring trails comes with risks you usually don’t have to worry about on roads. A primary concern for aspiring trail runners is getting lost—especially on long backcountry treks. As a basic precaution, when you leave to hit the trails, make sure to tell someone where you are going and when they should expect you to return. To minimize your risk of getting lost, study your route beforehand. Be sure to check in with trail markings and posted maps, if available, from time to time, and, if possible, carry a map—even if you have been on the route or in the park before—and compass. If you do find yourself lost, do not panic. If you can backtrack, follow your route backward; otherwise, if you are completely unsure of where you are, staying put is best, particularly if you told someone where you would be ahead of time. Learn how to make a shelter and start a fire, just in case, and carry the tools you’ll need for them—it is better to be safe than sorry. “With the many lightweight options available today, these essential items may add less than a pound to your running pack,” says Mike Foote, 31, of Missoula, Montana, whose backcountry jaunts can take him well out of range of both other humans and cell signal. Depending on where you are running, wildlife encounters can also be a concern. Making your presence known while you run can help avoid a surprise encounter and a defensive reaction by an animal. Mountain lions are usually risk averse and will likely stand down if you make yourself appear large and make lots of noise while slowly backing away. Don’t run, as this can trigger predatory instincts. Moose and bears, particularly grizzlies, may act aggressively if they perceive you as a threat to them or their cubs. Make yourself as un-threatening as possible by slowly backing away. If a moose charges, run; if a grizzly charges, you will not outrun it (and it may be bluffing), so play dead to seem non-threatening. Injuries are a concern for all runners—we love running, after all, and anything that keeps us from it should be avoided. In theory, the slower pace combined with lateral movements inherent in trail running can help build ancillary strength in your core and stabilizing muscles, potentially warding off injury. But trail runners are not immune. The pounding of running can take its toll no matter the surface, and precautions are in order to avoid unwanted time off. Rob Krar, 37, of Flagstaff, Arizona who in 2014 won the Western States, Leadville and Run Rabbit Run 100-milers, has spent more than his fair share of time healing from injuries. Before he became nearly unbeatable on the trails, he spent much of 2009 and 2010 suffering from severe sciatica and Haglund’s deformity, which causes inflammation between the heel bone and Achilles tendon, as well as recovering from surgery to fix the latter. He says a combination of preventative strengthening exercises (see below) and caution in training have helped him run healthy and injury-free for the last two-plus years. Do strength and “prehab” exercises: “Strength and conditioning work are one of the most important keys to my health and success the past few years,” says Krar. He says he has developed a twice-weekly circuit routine focusing on upper-leg, hip and core strength and flexibility. If you feel acute pain, have pain that worsens during a run and/or have pain that inhibits your normal running stride, take time off. If you have acute pain and incur the pain during a period of high-mileage or intense training, you may need to take extended time off. If you are ever in doubt, consult a professional; athletic trainers, chiropractors and physical therapists sometimes offer free initial assessments, so ask around. These exercises can help strengthen muscles crucial to strong running and injury prevention, and only take a few minutes after a run. Good for: Quadricep and glute strength. How: From a standing position, take one step forward, keeping your rear foot planted. Bend your knees, moving down until your quads are parallel to the ground. Do not extend your knee past the front of your front foot. Good for: Glute strength and recruitment. Due to our sitting lifestyles, many runners’ glutes are weak and/or don’t “fire” when we need them to, such as when you lift your leg or your foot lands in stride. Strong, working glutes will keep your body stable and absorb much of the shock of running, taking force off your knees and other injury-prone spots. How: Lying on your side, bend your knees to 90 degrees; keeping your ankles together, spread your knees apart and close them slowly, emphasizing the role of your glute muscles. Repeat several times on each side. Good for: Glute strength and recruitment; balance and supportive muscle strength. We spend most of our time running standing on only one leg, and strengthening your one-leg stance will make you stronger and less injury prone. How: Balancing on one leg, lower your body slowly; do not extend your knee forward past your grounded foot. Raise back up. Repeat several times on each side. Good for: Hip flexor strength. Your hips are key to trunk stabilization and weak hips will leave you uncomfortable and injury prone as you fatigue, especially when you need to navigate technical terrain. How: Wrap a Theraband or other resistance band around one foot or ankle; using your other foot to secure the other end of the band, raise the first foot with a straight knee; let it slowly back down. Repeat several times on both sides. Good for: Abdominal muscles. Your abs are only one part of your core, but they play a role in overall strength and stabilization. How: Lying face-down with a straightened back, raise your body up with your elbows and forearms on the ground in front of you. On each side, hold your body similarly aloft with one elbow and forearm on the ground, keeping your back straight. Hold for up to a minute in each position; repeat two to three times. As you gain experience, signing up for a race can provide even greater motivation to hit the trails and provide a starting point for adding structure for your training. But even if you don’t need that sort of structure to thrive, races are a fun way to test your progress as a runner and often see some new trails. Atmosphere: First, know that trail races are different than road races. The start and finish area might not have giant banners or inflatable archways, or fancy timing equipment (though many trail races have both); there may be more costumes, more shirtlessness and fewer sets of matching lycra racing uniforms; your finisher’s bounty is more likely to be a beer and a burger than a medal. In fact, the allure to many runners is the food, drinks and socializing at the finish area. Course markings: Absent a willing mountain biker, there will probably not be a lead vehicle, so navigation is more paramount. Anyone in the sport long enough will have a story about going off-course. Some races will be very thoroughly marked, with reflective orange flags never out of sight; others will have only minimal markings. Know what you’re getting into, and pay attention! Distances: Trail races vary in distance from 5K (maybe shorter) to 100-plus miles, but if you are brand new to trail running, err on the short side, say in the 5K to half-marathon range, to mentally acclimate to a trail-racing environment (as well as to the act of running at race pace over rocks and roots). Volunteers: Good races have well-trained volunteers. They mark and sweep the course, stock and man the aid stations and work the start and finish areas. Be sure to thank them. Do your homework: Know what to expect, and what you will need, for a race beforehand. What kind of terrain do you need to prepare for? Will you need a headlamp? What will be at aid stations (though you shouldn’t necessarily count on any one favorite item being there) and how frequent is aid? For a list of races in your area, check out our online race finder, or use a local trail-running group as a resource. Races: www.trailrunnermag.com/races/race-calendar – Find races based on location and date. Trails: www.trailrunnermag.com/destinations; www.trails.com – Comprehensive list of trails for hiking, biking and backpacking by state; www.nps.gov – Information on every National Park in the U.S. Also check out your own state’s department of natural resources for information on state parks. Bonk: A state of overpowering fatigue and mental fog occurring when your body’s glycogen stores are depleted. Buff: A versatile one-piece cloth band that often wraps around the head but can be worn, well, anywhere you can fit it. Fire Road: A designation for wide, smooth trails, including dirt roads used by service vehicles. These are the composition of trails with the build of roads. Gel: Liquid energy to ward off the bonk, usually in the form of a 100-calorie pack. (GU is one brand, and gels writ large are often referred to as “GUs,” a la Band Aid and Kleenex.) They are convenient to carry and range widely in flavor, ingredients and texture. Lugs: Traction-providing cleats on the bottom of a shoe. Smaller lugs work on a wider variety of surfaces for races that cross pavement, while more aggressive (larger) lugs handle better in the mud. Pack (aka Vest): small, tightly fitting backpack that can store water and gear. Ideal for longer outings and keeping your hands free during races. Runnable: Smooth, unobstructed terrain over which running a consistent pace is relatively easy. Shell: Somewhere between a long-sleeved shirt and a jacket, a shell is a very light technical outer layer designed to trap body heat and protect you from the elements while maintaining ventilation. Singletrack: The narrowest and most aesthetically pleasing form of trails, this is often only wide enough for single-file running. It is also usually a mountain bike trail, so pay attention. Technical: The opposite of “runnable”—uneven terrain with numerous foot-grabbing obstacles on which running is very difficult and fast hiking is employed. Ultra (aka Ultramarathon): Races longer than 26.2 miles; common distances are 50K, 50-mile, 100K and 100-mile. Vert: Shorthand for “vertical.” Usually refers to the number of feet or meters climbed and descended during a given run or race. Trail running, on the whole, may seem intimidating, conjuring up images of Herculean athletic feats. You can can get sucked into obsessing over the plethora of shoes, clothes, hydration gear and nutrition options. But relax. Aside from a few details that will quickly become second-nature—which we have attempted to provide in this overview—trail running is a beautifully simple experience that you can make your own. You can run alone or with a group, in the shoes and gear that make you comfortable, in whatever place you want. There are as many trail-running experiences as there are trail runners, and you will soon add your own story to the list. So go hit the trails. We’ll see you out there.